An administration official said Trump is looking at a "wide range" of options. President Donald Trump is considering executive action that would bar migrants from crossing the U.S.-Mexico border and seeking asylum, a senior administration official confirmed late Thursday to ABC News. Such a move would almost certainly be challenged in court. The push comes just 11 days before crucial midterm elections in which Democrats believe they have a chance to flip the House and several state governor races. That is a scenario that would present a serious challenge to Trump's agenda, which he has recently described as a "nationalist" approach that puts "America first." "The administration is considering a wide range of administrative, legal and legislative options to address the Democrat-created crisis of mass illegal immigration," the official told ABC News. "No decisions have been made at this time. Nor will we forecast to smugglers or caravans what precise strategies will or will not be deployed." The assertion that Democrats created the crisis of illegal immigration in the United States is not accurate. Under both political parties, the U.S. has faced a steady uptick in illegal migration across its southern border, due primarily to war and poverty in Central America. President George W. Bush tried to push through a bipartisan compromise that would have offered the biggest changes to immigration laws in 20 years, including strengthened border security, but it collapsed amid opposition on both sides, including hardline conservatives who balked at granting some immigrants what they called "amnesty." Trump has been focused on what options he has to deliver on his campaign promise to build a wall along the southern border, a proposal that has not had sufficient support in Congress. (Robert Zepeda/ABC News) A migrant child barely able to continue onward jumps onto a truck to rest during the caravan to Tapachula, Mexico. Omar Jadwat, director of the ACLU’s Immigrants’ Rights Project, said it was "disgraceful" that the Trump administration would even consider closing the border to asylum seekers. Under federal law, people can obtain asylum in the U.S. if they have credible evidence of persecution back home. Most asylum seekers pass an initial screening and then are either held in a detention center or released on bond while their cases wind through the immigration courts. Trump and his supporters say the system is broken because many people are released into the U.S. and fail to return to immigration court. But Trump's hardline policies, including a "zero-tolerance" approach that resulted in some 2,600 children separated from their parents at the border, seems to have had little effect on attempts by migrants to seek asylum. (Rodrigo Abd/AP) Central American migrants traveling with a caravan to the U.S. make their way to Pijijiapan, Mexico, Oct. 25, 2018. 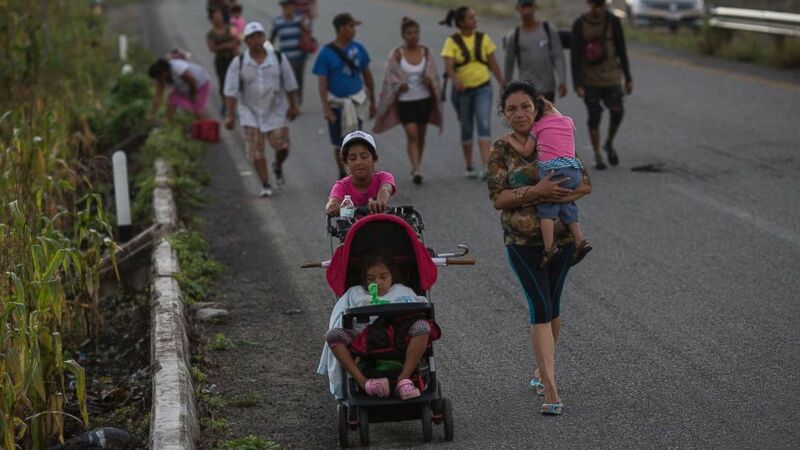 A separate caravan of Central Americans earlier this spring was undeterred by Trump's angry rhetoric and waited nearly a week to be processed. 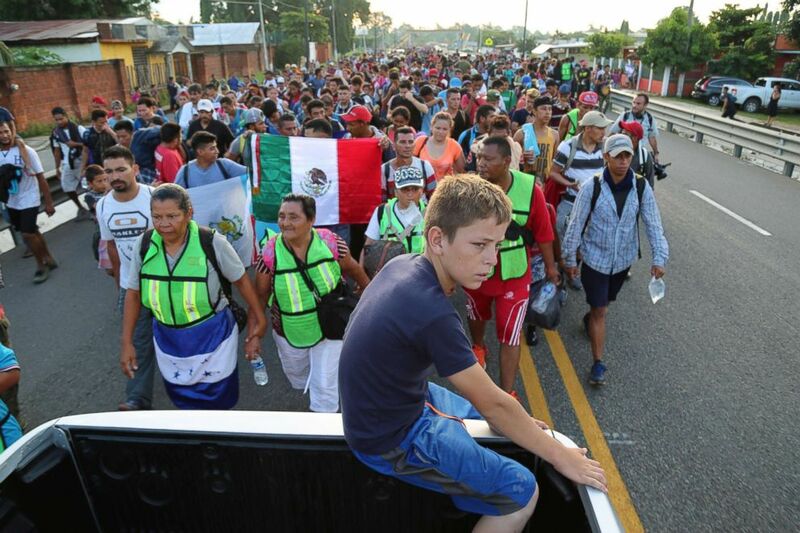 The latest caravan is estimated by the United Nations to have grown to more than 7,000 people who say they joined the dangerous journey because poverty and gang violence have limited their options. Overall, illegal border crossings plunged after Trump's election but are now returning to levels from before Trump took office. More than 396,000 people in the past year have been arrested trying to cross the southern border, a figure closer to 2016 levels after the number dropped to 304,000 in 2017. And according to new data released by U.S. Customs and Border Protection, the number of apprehensions of family members spiked after Trump's zero-tolerance policy went into effect. CBP reports that the agency arrested 16,658 people in families in September compared to only 8,875 in March. With the election days away and several tight races in play, Trump told supporters at a rally in Wisconsin this week to "wait until you see what happens over the next couple of weeks." Defense Secretary James Mattis has signed an order to deploy hundreds of active duty troops to the southern border. The initial estimate is that 800 to 1,000 U.S. military personnel could deploy, primarily to help with logistics at the border. There are already about 2,000 National Guard troops called up by the governors of Arizona, New Mexico, and Texas. Like Guard troops already activated, these new active-duty troops will not be engaging with migrants but would retain the right to self-defense. "You're going to see a very secure border," Trump told voters earlier this week. "You just watch. Just watch. Very secure. And the military is ready. They're all set. They're all set." On Thursday, within minutes of giving a speech on drug prices at the Health and Human Services Department, Trump fired off a tweet on the caravan as though to pivot the conversation back to immigration. "To those in the Caravan, turnaround, we are not letting people into the United States illegally," he tweeted. "Go back to your Country and if you want, apply for citizenship like millions of others are doing!" Trump imposed a travel ban on several majority-Muslim nations shortly after taking office. The ACLU challenged that ban in court, as it would almost certainly do if Trump embraces a plan to deny asylum seekers at the southern border. But a version of Trump's travel ban on Muslim nations was ultimately upheld by a sharply divided Supreme Court, with the conservative majority taking his side in support of presidential power.